In this document the search options concerning tautomers are summarized and their usage is shown in different search interfaces. See detailed description of tautomer search here. 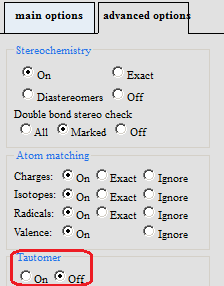 is: ignore tautomer stereo (tautomer search is turned on but stereo information is ignored in the tautomer regioms). Option can be set on Query>advanced options tab in Tautomer panel. Default value is "Off".